U Rozvařilů is mentioned in the anecdote about colonel Fliedler von Bumerang. U Rozvařilů was a brewery and entertainment establishment at Pořící. It still exists, albeit in another form: as a restaurant in the department store Bílá Labuť. [3.3] Železnýmu už to bylo všechno jedno. Tak jak šli přes Poříč, kolem Rozvařilů, Železný skočil do průjezdu a ztratil se mu průchodem a zkazil Kaučukovýmu dědkovi tu velikou radost, až ho bude sázet do arestu. U Bucků is mentioned in the anecdote about colonel Fliedler von Bumerang. U Bucků was a brewery and restaurant at Pořící in Prague, next door to U Rozvařilů. [3.3] Až takhle jednou vod našeho regimentu podařilo se jednomu probodnout jednoho dragouna v hospodě ,U Bucků’, kterej mu chodil za holkou, a tu nás seřadili do čtverce, museli vyjít všichni, i marodka, kdo byl moc marod, toho dva drželi. Nakladatelství Šimáček is indirectly mentioned by Dub who points to a melodramatic article about the killings Sarajevo in the magazine Šimáček's Four-leaved Clover from July 1914. 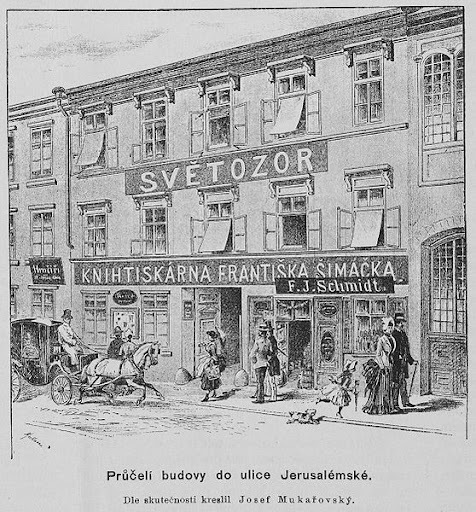 Nakladatelství Šimáček was a Czech publishing house founded by František Šimáček in 1856. In 1914 it was managed by Bohuslav Šimáček. They published the illustrated magazine Šimáčkův čtyřlístek which is referred to in the novel. The magazine appeared twice a month. The company was located in Jerusalémská ulice in Nové Město. [3.3] Nadporučík Lukáš jen zamručel k sobě, že asi zde v Humenném četníci odebírali Šimáčkův Čtyřlístek s tím dojemným článkem. Vůbec se mu počalo vše najednou hnusit a cítil jenom potřebu opít se, aby ho opustil světobol. Vyšel tedy z vagonu a šel vyhledat Švejka. Na zastávce was one of the pubs where Josef Kalenda made a stop on his World Tour. A pub with the same name is mentioned again in the next chapter in the anecdote about the construction site foreman who was not to drink alcohol. Na zastávce was seemingly a pub in Královské Vinohrady. It is most probably referred to a pub in Palackého třída 713, now Franczouska. There were nevertheless two other pubs with this name in Prague but none of them fit the route of Josef Kalenda. Vinohradská vodárna was the place where Josef Kalenda started to enter pubs on his way around the world. Vinohradská vodárna is a former water tower in Korunní třída, a neo-renaissance building finished in 1891. Kostel svaté Ludmily is also mentioned in the anecdote about Josef Kalenda. He walked past this church on his world tour. Kostel svaté Ludmily is a twin-spired church at Náměstí Míru in Královské Vinohrady, Prague. It was opened in 1892. Jaroslav Hašek and Jarmila Mayerová married here on 23 May 1910. U remisy was the pub where Josef Kalenda from Švejk's anecdote made a bet with a tram driver from that he could walk around the earth in three weeks. U remisy was apparantly a pub in Strašnice, to judge by the name near a tram depot (vozovna). There is a tram depot in Strašnice still, located in Vinohradská třída. It was opened in 1908 and was the oldest of its kind in Prague. In 1910 there were three taverns close to the tram depot, two of them next door at Jungmannová třida 93 and 107. The landlords were Josef Šmíd and Josef Wagner respectively. Both are listed as na Kovárně but may still have been known as "U remisy" in day to day speak. The excact identification is therefore difficult, but Wagner's pub is probably the best bet as he is the only one listed in the address book for Královské Vinohrady from 1912. Note that the border between Strašnice and Vinohrady went between the tram depot and the two pubs but Svejk would probably not have been aware of this fine distinction. A restaurant with the same name in the same place still existed in 2010 although the address was very different both with respect to street names and house numbering. Černý pivovar was one of the pubs Kalenda dropped by on his legendary pub crawl (world tour). 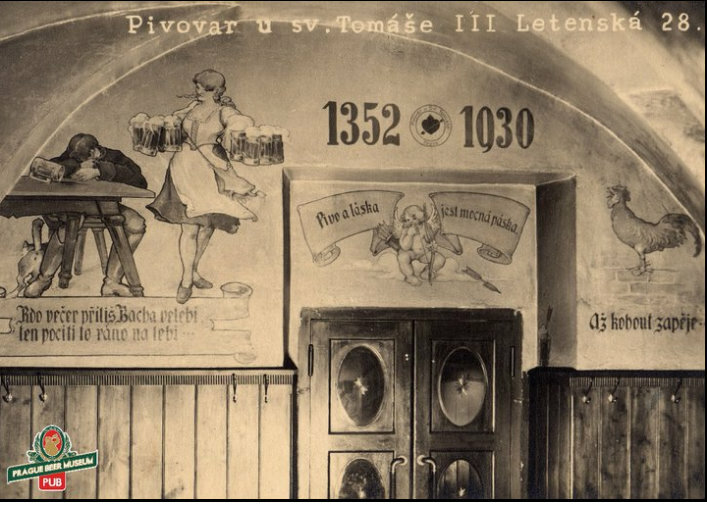 Černý pivovar was a brewery and restaurant with address Karlovo náměstí 15. In 1891 it was registered in the name of František Fiala and was operating until 1920. In 1934 the restaurant re-opened in the new building constructed on the site but we don't know when it closed down again. The bulding still exists but has an entirely different function. [3.3] Počal se tedy dál a dál vzdalovat vod svýho domova, až se přivalil do ,Černýho pivovaru’ na Karlově náměstí, a vodtamtuď šel na Malou Stranu k Sv. Tomáši do pivovaru a odtamtud přes restauraci ,U Montágů’ a ještě vejš přes hospodu ,U krále brabanskýho’, pak na ,Krásnou vyhlídku’, odtud do Strahovskýho kláštera do pivovaru. U svatého Tomáše was one of the pubs Josef Kalenda dropped by. U svatého Tomáše was a restaurant and brewery in Malá strana, known for their dark beer. It was one of the oldest breweries in Bohemia but closed in 2006 when the building was converted to a hotel. U Montágů was one of the pubs Josef Kalenda dropped by. U Montágů was a restaurant at Malostranské náměstí which in 1891 and even as late as 1910 was owned by Antonín Janda. The building U Montágů still exists but is better known by the name Palác Smiřických. It is a part of the building complex that is used as a seat of the Chamber of Deputies of the Czech Parliament. 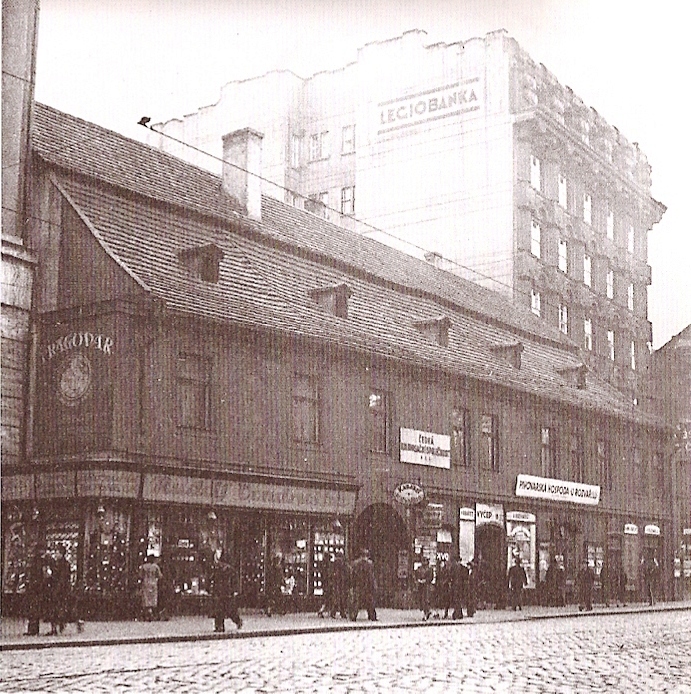 Note that the pub was in the next building down, also known as Šternberský palác. U krále brabantského was one of the eight namned pubs that Josef Kalenda visited on his world tour which ended up as a pub-crawl. It must have been about here that Bláhnik and Švejk planned the dog-theft in [I.14]. See Zamecké schody. U krále brabantského is one of the oldest pubs in Prague, now part of a chain which uses the Medieval times as theme. It has roots back to 1475 and amongst the prominent guests through the years can be mentioned: Edward Kelly, Jaroslav Hašek, Karel Čapek and Wolfgang Amadeus Mozart. Na krásné vyhlídce was one of the eight pubs mentioned by name that Josef Kalenda visited. Na krásné vyhlídce was a pub near the Strahov Monastery. According to the address books from 1891 and 1910 there was a pub with this name in Úvoz 31 and the description fits well. Today the address does not exist, but from old maps it can be seen that it must have been current number 13/156. The building on the site today is from more recent times and houses the Swedish embassy. Strahovský klášter is mentioned because Josef Kalenda popped into the monastery brewery just before homesickness overwhelmed him. Strahovský klášter is a monastery on the Strahov Hill in Prague and one of the Czech capitals many beautiful landsmarks. 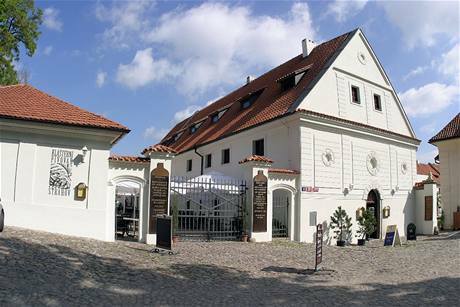 It is situated in the Hradčany area, not far from the castle itself. It belongs to the Premonstratensians order and was founded around 1140. Klášterní pivovar was the final stop on the odyssey of Josef Kalenda, before homesickness got the better of him down at Loretánské náměstí. Klášterní pivovar is a brewery using he name of the monastery but is otherwise independent. It has operated as a microbrewery since the year 2000 after brewing operations ceased in 1907. The operation may have continued a restaurant even after the brewery closed, something which Švejk's anecdote suggests. The address book of 1910 points in the same direction. Odkolek and the fire at their mills are mentioned by Švejk in his sleep. Odkolek is a flour mill and bakery which was founded by František Odkolek in 1850. The fire referred to happened in 1896, and it was the original mill at Kampa that burnt down. It was not reconstructed, a new mill was built at Vysočany instead. The factory is now owned by United Bakeries. The old mill has since been rebuilt and today it houses Muzeum Kampa. Polevkové ústav města Prahy is mentioned by Švejk during a discussion on Marek's invented story about Vaněk's glorious death. This scene took place on the train just before Sanok. Polevkové ústav města Prahy has sureley been a municipal institution that ran soup kitchens, but further information is not available. Hašek also wrote a short story called Polevkový ústav, which might reveal more information.